The folks at Pageonce are forever coming up with ways for you to manage your busy life from your iPhone, iPod touch, or iPad. Whether you want to track your flight schedule, your stocks, or even your cell phone minutes, the developer has free and paid apps to assist you. Now comes another handy offering, Pageonce Bills. Where Does All the Money Go? : In addition to tracking what you paid and what you and sending you notifications when bills are due, Pageonce Bills also breaks down your expenses by category. At first glance, not much distinguishes the free app from another free Pageonce offering, Personal Finance. Both promise to help users manage their money and their lives. But a closer look reveals the Bills app is more narrowly and neatly tailored to fit the needs of us earthbound paycheck-to-paycheck types—there’s no investment tracking or travel schedules to be found here. That’s fine, because Pageonce Bills does its job well: It connects to your online bill-paying accounts. It tracks what you’ve paid and what you owe. It pushes notices to you when it’s time to pay—both through messages on your phone and e-mail reminders—and it offers angry little orange-coded alerts when you’re a couple of days past due. 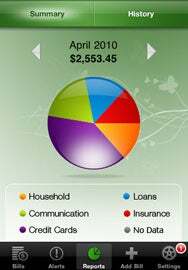 It also lets you organize your expenses by category, offering color-coded charts that divide your bills into major categories like “household,” “communication,” “credit cards,” and more. The app comes ready to plug into the bill-paying Websites of a number of well-known companies, but is flexible enough to let you add new sites. Perhaps most important, Bills promises privacy and “military-level” security. The company Website features logos from four different online-security companies, offering serenity that managing your finances from your iPhone won’t end up spreading your information to scammers. If that’s not enough, Pageonce also lets you password-lock the app—if you lose your phone, you won’t lose control over your bills—and you can confine your Pageonce account access to a single phone. 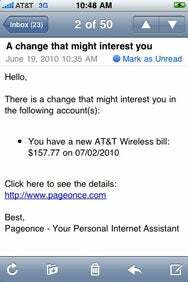 A Friendly Reminder: Pageonce Bills can send you messages and e-mails when a payment is coming due. There are minor shortcomings with the app. You can’t actually pay your bills using the app; the lack of that ability keeps Bills from being a real masterpiece. And the app isn’t at all helpful at tracking bills that don’t have an online component. You’ll probably be able to track your mortgage on this app, in other words, but it will be easy to forget to pay the rent. Even in 2010, there are some things you can’t do online or via the mobile Internet. Quicken’s mobile app might let you track those kinds of bills more easily—but then again, it won’t provide you with the same kinds of warnings or detailed information that Pageonce BIlls does. If the vast majority of your bill-paying life is lived online, though, Pageonce Bills is the ideal app to help you manage your money. It’s ease of use and gentle reminders make it less likely that you’ll forget to pay the cable bill—or bounce a check when you do.